No matter you're a teen or the parent of a teen looking for an effective yet mordern-day solution, Invisalign® and Invisalign Teen® can provide a simple way to accomplish this without having to put your life on hold. Invisalign system is virtually invisible way to straighten your teeth and achieve the beautiful smile you've always wanted. a series of clear aligners are specifically fabricated for your teeth only, each aligner is worn for about 2 weeks (daily wearing requires about 22 hours) to move your teeth little by little. 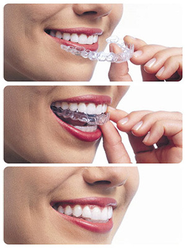 To check if invisalign is right for you, please schedule a complimentary consultation appointment with us!